Computer company Kano offers building kits that let users construct working devices and learn to code. The company’s latest kit brings the world of Harry Potter to life for kids by letting them build their own magic wand. The Harry Potter Kano Coding Kit features a tutorial that helps kids build a magic wand while learning about sensors, data, and code. From there, they can use the associated mobile app to participate in more than 70 step-by-step challenges inspired by the Wizarding World of Harry Potter. The app takes players to Hogwarts, Diagon Alley, Hogsmeade, and The Forbidden Forest. Each challenge asks kids to create the proper code using coding blocks. Once they do, they can wave their wand in the real world to trigger the appropriate on-screen animation. As examples, players can cast magic spells, cause pumpkins to grow in size, paint pictures, create music, and more. In addition to completing the kit’s stock challenges, kids can play with art, music, and games created by people around the world by visiting the Kano World community portal. 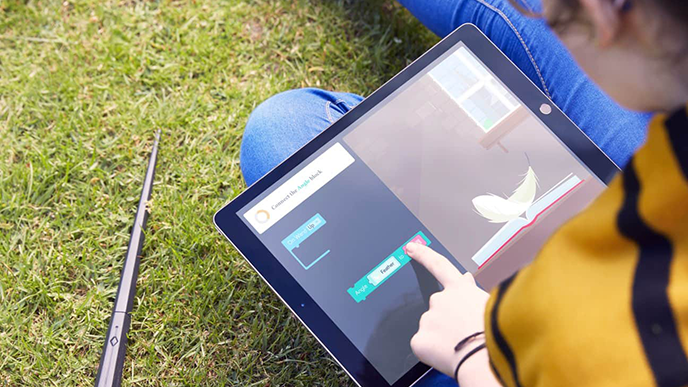 Kano World offers over 620,000 creations for kids to tinker with. The Harry Potter kit will work with iOS and Android tablets, as well as Windows and Mac computers. Parents can pre-order the kit now for $99.99 on Kano’s website. It’s expected to launch October 1, 2018. Kano’s Harry Potter kit is one of a growing number of toys and apps designed to help kids learn about coding and other STEM careers. Robotics Engineer Barbie stars in an online experience for kids that lets them learn about programming and how it relates to real life careers, for example. Another toy, LOMO, uses a robot to help kids learn coding without any required screen-time.